First of all I need to apologize for such a delay with Togo seatings recolors, guys. I'm still working on them, but so far I made only three of supposed nine sets in a whole. And my newest project, which I presenting today, interrupted the recoloring process for a while. I'll be back to it as soon as possible. And now... Ta-da! 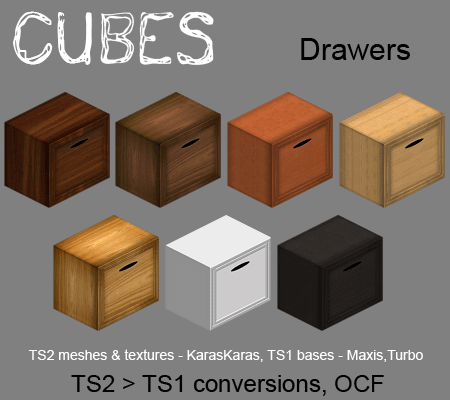 Olena's Clutter Factory proudly presents the Magic Cubes of Flexibility! LOL! These are conversions of famous Sims 2 cubes by KarasKaras and thanks to generous policy of original author, now are made for Sims 1. Also my heartfelt thanks to Yamirose @ Mirrored Sims, whose recently created stackable file cabinets greatly inspired me and become a base for initial object of this set. 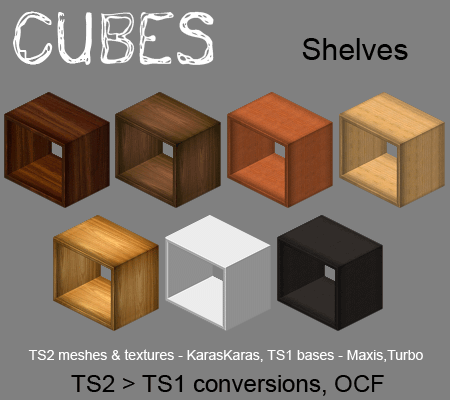 Hers are based on Aponee's Cube set, which is in turn based on Turbo's endlessly stackable end tables. I added two more colors to original five (white is especially for you, Mike! LOL!) and also some more functionality and flexibility. Please, carefully read below! Looks not very impressive, yes? You would think - yet another set of plain stackables... Surprise! Inside the downloaded archive you will find 35 object files. What exactly are they? 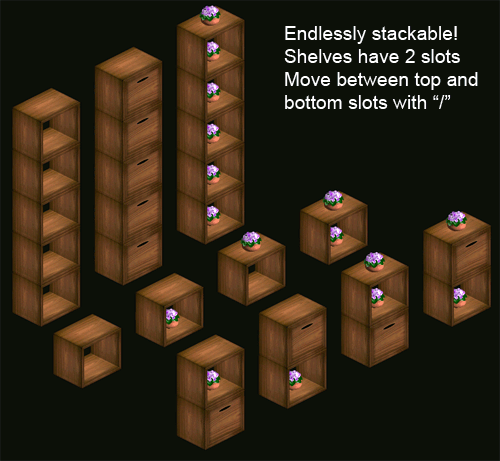 1) Files named "shelf" and "drawer" are endlessly stackable end tables, slightly edited. Each shelf have two slots for object placement - top and bottom. You can move objects between these slots with "/" key. Unfortunately not all objects can be placed on a bottom slot - some are just not fit by size and will bleed through, some are not allowed to be placed on this height. Most Maxis lamps, small plants, little deco pieces such as souvenirs, candles and awards will work. Also a lot of my objects - books, iPods, clutter will work as well. Drawers are 1 slot only - on their top, which is logical, I think. Both are not constantly buyable, like original was. You have to place each one separately or press "Shift", while object is selected, to build high stacks. They will look great as dividers in lofty rooms, but do not stack more than 3 near the wall - it will not look good. They can be placed over each other in any order and still have full functionality of the surface. 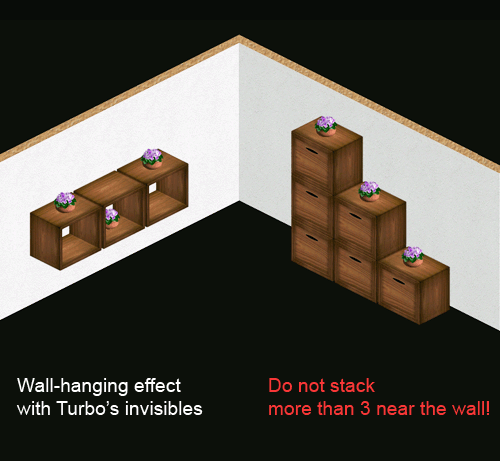 Turbo's invisible tables will make them look like hanging on the wall. All other items of the set look like the drawers, but have different functionality. 2) Files named "bookcase" - besides being a normal bookcase, they can be placed almost anywhere - on the floor, on shelves and drawers, on endtables and on each other as well. And most important - they can hold other pieces of the set and any object you place on them. Though Sims themselves can't place anything on them. But if you place, for example, a boombox on top of bookcase they still can use both. 3) Files named "dresser" - they're dressers and surfaces at the same time. All said above about bookcases, applies to dressers as well. Except, that the Sims can place stuff on them - but be careful - some things, bills for example, may disappear. 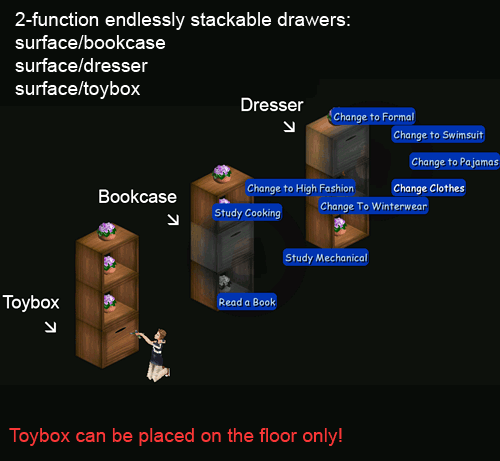 4) Files named "toybox" - they are toyboxes/surfaces. Technically they're still 2-tile objects, so you can't place them anywhere besides the floor. But good news - you can place everything on their top. Sims will not use them as surfaces voluntarily. If you'll have any further questions or problems - don't hesitate to let me know here or Sims 1 forums. Awesome. Absolutely awesome! You've done a terrific job on these! Thanks so much Olena - the cubes are wonderful! Thank you all so much for your lovely comments, friends! I so love comments! Whee!! !